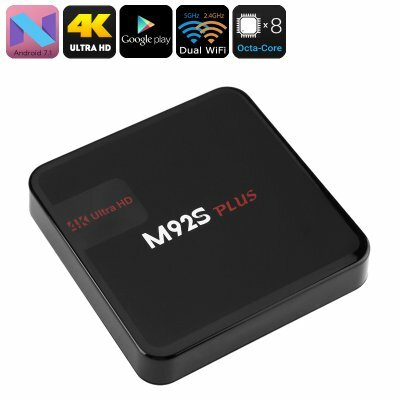 Successfully Added M92S Plus Android TV Box - Android 7.1, Octa-Core CPU, 2GB RAM, 4K Support, Google Play, Miracast, Dual-Band WiFi to your Shopping Cart. Turn your living room into your private cinema with the M92S Plus Android TV box. This TV box runs on the latest Android 7.1.1 operating system. Thanks to this, you’ll be able to enjoy a magnificently smooth user experience. With access to the latest software features, you’ll be able to take full advantage of all this Android 7.1 TV box has to offer. You’ll have access to the Play Store and Kodi TV. This will offer you unlimited access to millions of free to download games, Apps, and more. From now on you and your friends will never have to feel bored again. It can be used to watch a film with your family or to play games with your friends. This Android TV box will meet all your demands. With Dual-Band WiFi support, this 4K TV box lets you browse the web at lightning speeds. You’ll be able to stay in contact with friends and download files in the blink of an eye. Nothing is too much for this Android media player. Additionally, your 4K TV box supports features such as miracast and Bluetooth 4.1 to further enhance your user experience. With 16GB or internal storage and a 32GB SD card slot, you can be assured that there always will be plenty of space to store your latest games and media. This Android TV box supports 4K resolution. This means that all of you who own a 4K TV set will be able to enjoy your favorite films and series in breathtaking quality. Never again have you been able to enjoy such detail and vivid colors. This 4K TV box truly treats you with a cinematic experience in your own living room. To make sure it is able to run the most demanding media, it comes with the Amlogic S912 processor. This Octa-Core CPU has been clocked at 2.0GHz. Along with 2GB RAM, you can be assured this 4K TV box handles whatever you throw at it.